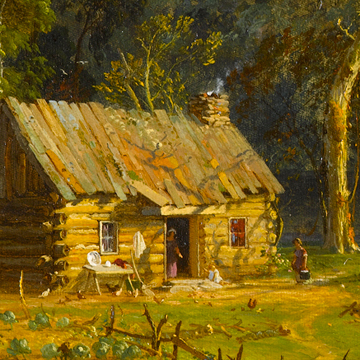 Long ago, families lived in the wilderness and struggled to adapt to their environment. I want you to imagine you and your family are the people in this painting. 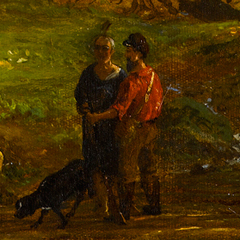 Are there any clues in the painting that tell you who you are and where you live? There is a log cabin in the middle of a forest and a farm with livestock such as cows and chickens and sheep. You and your family are pioneers. Are there any clues in the painting that tell you what time of year it is? Look closely. There are pumpkins ripening in the garden, and there are corn stalks and sunflowers. It must be late summer or early autumn. Look at the rays of light that are playing across the mountaintops and the cabin, trees and grass. What time of day is it? Is it morning or is it evening? What do you see in the painting that makes you say that? Describe what is going on. 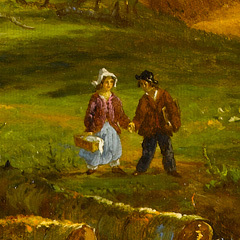 Two figures in the foreground are standing on a newly made road of logs. Who are they? Let’s pretend the figure on the right in the red shirt is your father. Who is your father talking to? He is talking to an indigenous person from America from long ago. How can you tell this figure is an indigenous person from America long ago? If you look closely, perhaps you can tell he is wearing clothing made out of animal skins. A dog is at his feet. What do you think your father and the indigenous person are talking about? I will give you a clue. 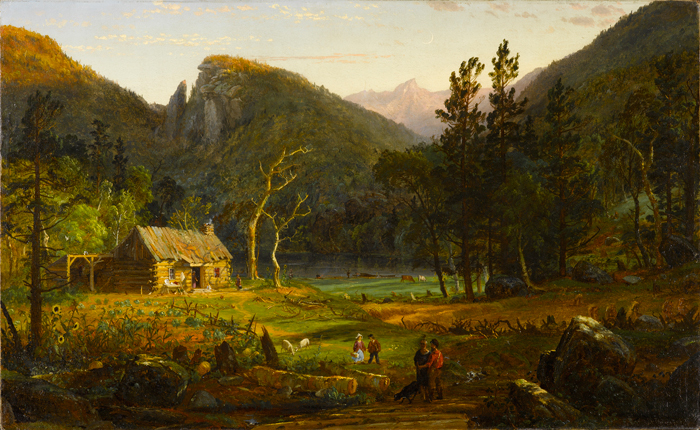 The title of this painting is Eagle Cliff, Franconia Notch, New Hampshire. Where is New Hampshire? New Hampshire is a state in the northeastern part of the United States. What is winter like in New Hampshire? Winter is very cold and snowy there. Long ago, it was a very serious business to learn how to store food for the long winter months and survive. Perhaps the indigenous person is giving your father advice on how to make it through the coming winter. What else is going on? Your mother is standing in the doorway of your log cabin. Your little sister is playing nearby. An older sister is toting water from a river or lake nearby. Another sister and brother are walking hand-in-hand toward your father. Is your sister carrying something? Yes, she is carrying a basket. What do you think is inside her basket? Perhaps there are vegetables from the garden or eggs inside her basket. Perhaps the basket is a gift for the indigenous person to thank him for his help. Or perhaps your brother and sister are going somewhere. Can you see what your brother is carrying under his arm? He seems to be carrying some kind of book or notebook under his arm. Perhaps your brother and sister are going to school, which at the time would have been a tiny one-room schoolhouse. Perhaps your sister is carrying their lunch in her basket. You have made some great observations. Now use your language arts skills. Describe the character traits pioneers must possess to survive a long, cold winter. Must they be strong and resourceful? The pioneers who settled the wilderness in America long ago had to learn many skills because their survival was not guaranteed. They had to learn how to grow crops suited to the climate and preserve these crops for the winter. They had to learn how to hunt animals and use animal skins for clothing. Most importantly, they had to learn how to quickly adapt to their environment. Give me your opinion. Do you think your pioneer family will make it through the coming winter? What clues in the painting tell you so? Will they have enough firewood from the forest? Are there enough crops in their garden? Is there enough milk from their cows? What about the dark, encircling forest and the scrawny pair of leaf-less trees, whose shadows fall across their weatherworn cabin? Is your pioneer family prepared for the coming winter or are they unprepared? Would you like to see Eagle Cliff in person? All you have to do is visit the North Carolina Museum of Art in Raleigh, North Carolina. Eagle Cliff is in the American galleries at the museum. Or perhaps you would like a tour. Tours of the collection are given daily, except for Monday when the museum is closed to the public. If you prefer, you can contact the museum ahead of time and arrange for you and your friends to have a private tour. I’m sure a docent at the museum would be happy to show you and your friends Eagle Cliff and many other works of art. Whether you visit the museum on your own or have a tour with a docent, it will be well worth your time!